I know its been awhile since I last posted anything, I've been really busy at work and I do sincerely apologise. 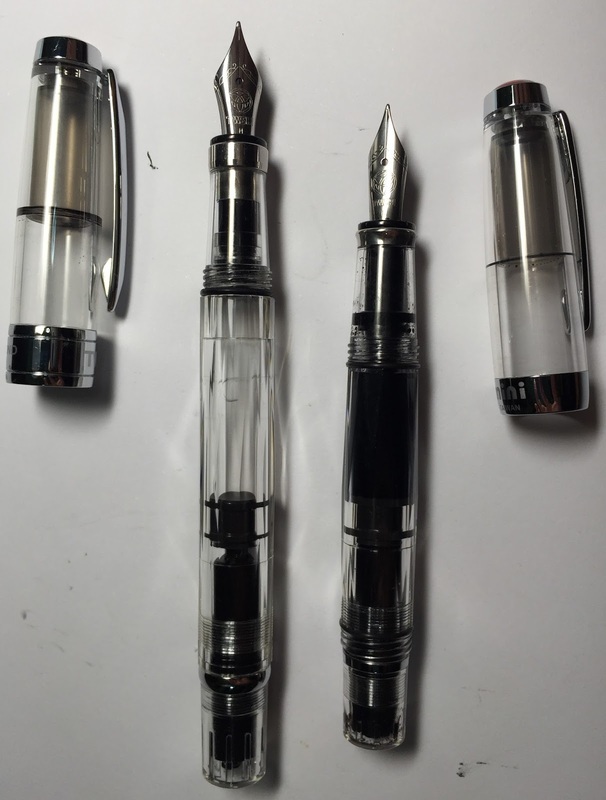 In this post, I would like to share my experiences with my TWSBI 580 ("580"), and also the TWSBI mini ("Mini") which I bought for my wife as a Mother's Day present this year (both pens pictured below). 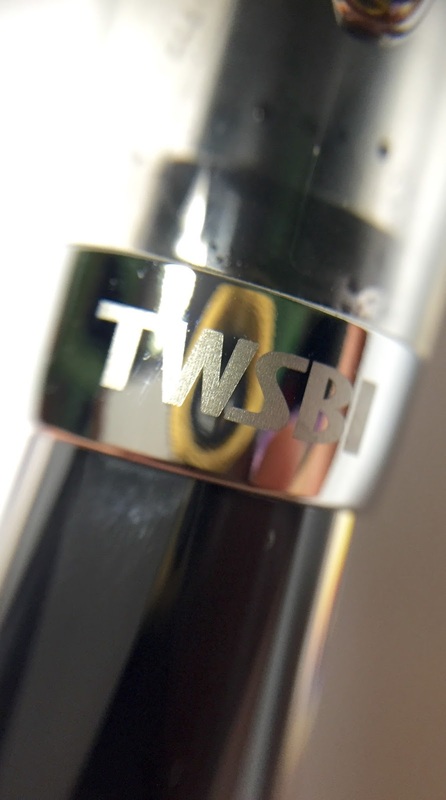 According to TWSBI's official website, the initials "TWS", was derived by reversing the acronym of "SWT". "SWT" was in turn then meant to be an acronym for the Chinese characters of "San Wen Tong" (or "三文通" which, according to TWSBI, symbolises the fabled "Hall of Three Cultures"). Lastly, the word "Bi" refers to the Han Yue Pin Yin word for "笔" ("pen"). If you are scratching your head wondering what all that means, simply look to TWSBI's corporate mission statement, which reads: "To inspire and recapture the romanticism of art and literature...starting with the pen". Another thing that attracted me to the TWSBI branding was the fact that they are so proudly Taiwanese. Having been to Taiwan several times, and having stayed there for extended periods of time, I have a high esteem for their people, culture and identity. Much akin to the deference that many Asians commonly feel towards the South Korean and Japanese people. I got my 580 from Mr Sunny Koh of www.straitspen.com, for S$65.00 with another $4.00 for (local) postage. I bought the Mini from overjoyed's retail store at Golden Wall Centre (89 Short Street, #B1-08, Singapore 188216) for about S$52.00, when it was on sale (i.e. 20% off the usual RRP of S$65.00). Piston-filling mechanism, no rear-blind-cap over the piston knob and comes with a screw-on cap. 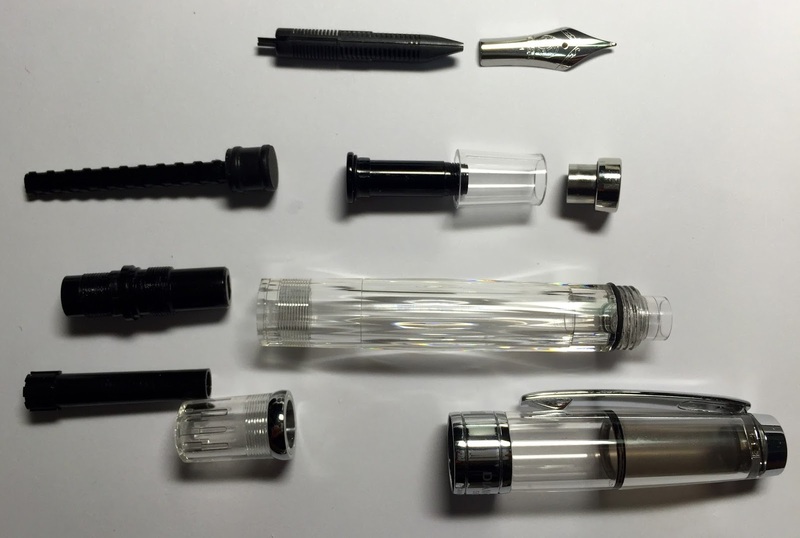 If you've read the other articles on my blog, you'll know that I am hugely inclined towards clear demonstrator pens. Needless to say, I am going to be unreservedly biased in my assessment of the overall aesthetics of these pens! I love the look and feel of both the 580 and the Mini (since they are practically identical). Though the pens are comprised mostly of plastic parts, I have never once gotten the impression that the pens were cheap, light-weight or insubstantial. Quite the opposite actually. The pens feel surprisingly "beefy", adequately-weighted and also nicely balanced; especially so when writing. The deceptively "light" look of the pens come from the fact that you hardly see any of the metal trimmings on the pen. This is because the silver accents of the metal parts blend in so naturally with the rest of the clear glossy plastic parts. One therefore tends to forget that that's where most of the pens' weight come from. 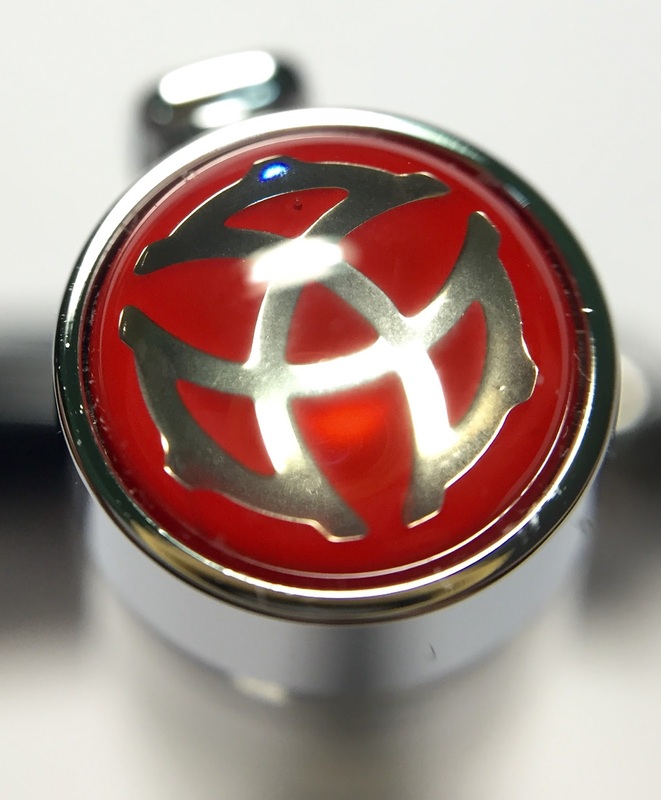 As the very first picture of this post shows, TWSBI's eye-catching red and silver trade mark is prominently affixed on the top of the cap. 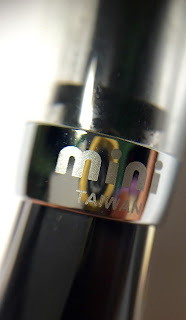 Finally, as you'll notice, engraved onto the cap ring are the words "TWSBI", "Taiwan" and depending on the pen, the model of that particular pen (i.e. "Diamond 580" and "mini" respectively). Given the clear body of the TWSBI pens, you can also "change" the colour of the barrel by simply filling the pen with any beautifully coloured ink of your choice! 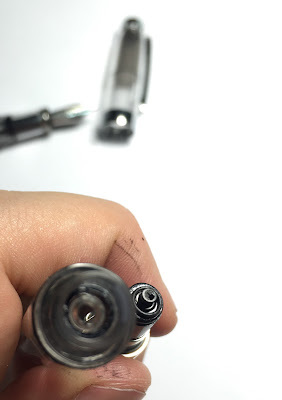 Disassembling a TWSBI is easy (its putting it back together that's the hard part - I'll explain what I mean in greater detail at section (D) below). Everything screws into place, nicely. TWSBI even provides, with every one of its pens, a tiny spanner to unscrew the piston from the barrel of the pen. If you're interested in finding out how you go about disassembling a TWSBI pen, check out Mr. Brown's video here, Mr. Goulet's video here, and even TWSBI's official tutorial page here. Because TWSBI pens are so readily broken down into its individual components, they are therefore very easy to clean. 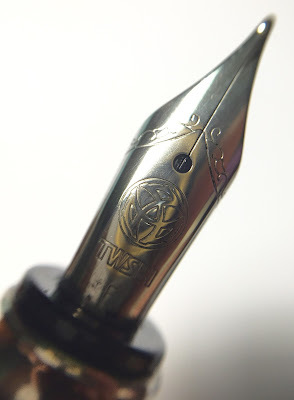 This is another aspect of TWSBI's pens that I find truly amazing. Not only is each and every part so intricately and meticulously fabricated, they also always fit back together seamlessly (if done right). This is another true indication of Ta Shin Precision's ("TSP") skill, craftsmanship and pride in its products (if you are interested to learn more about TSP, see Fountain Pen Economics' Brand Analysis blogpost here). After disassembling the pens, just dump the contents in a bowl of water and let them soak for several hours. Once the excess ink has diffused into the water, take the parts out, wipe them off to dry (with a lint-free cloth), and you're ready to reassemble the pens and ink them up again! From what I understand, TSP manufactures everything except the nibs on their pens; which are actually German-made JoWo (Steel) nibs. It was therefore not surprising that my 580, fitted with a Medium nib, delivered an almost identical writing experience to my Lamy Vista (medium) and my Schneider iD (broad) pens (with only varying degrees of wetness). My 580 is smooth. Lays down a wet line. Offers almost no flex (and therefore provides little to no line variation at all), and has a stiff and rigid feel when writing. Therefore, for the price you pay (S$65 for a piston-filler pen with a screw-on cap), and the writing experience you get, you are actually getting an extremely good-value-for-money deal! 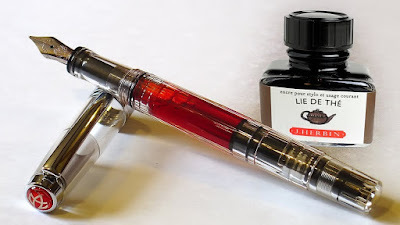 There is a lot of positive literature online about how well the 580s write (for example see Chase McCoy's review on the penaddict blog here), and TWSBI has already garnered somewhat of a loyal "cult-following" amongst fountain pen enthusiasts. 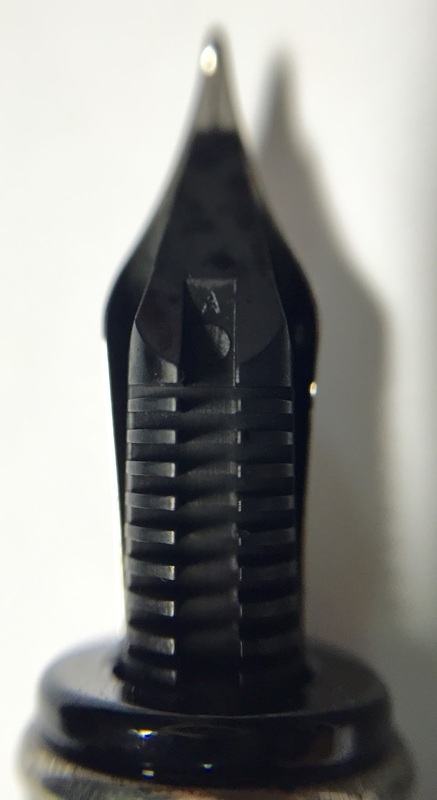 As for the Mini, being a fine nib, it lays down an extremely thin and dry line (comparable to a "Japanese fine", which is surprising coming from an European nib manufacturer). Though I would often rave about the 580's smooth writing experience (and price-point), I was however sorely disappointed by the Mini's performance. On the Mini, the fine nib feels scratchy, rough and doesn't quite glide across the page as one would expect. My wife, whom I bought the Mini for, was similarly not impressed. I know my wife rarely uses her Mini, and if she does, its only to humour me. To date my attempts to convert my wife into a fountain pen user has been unsuccessful. She thus resolutely remains a (predominantly) roller-gel pen user. Can the pens be posted? One of the things that I do like about the Mini, would be the fact that there are threads at the rear of the barrel, and allows the cap to screw firmly onto the back of the pen when posted (and not directly onto the piston-filler-knob). This, obviously, indicating that the Mini was designed and therefore meant to be posted when writing. This transforms the Mini from a "convenient-pocket-sized" fountain pen (i.e. in the same vein as the Kaweco Sport) into a full-length fountain pen (that sits comfortably in your hand). The 580, on the other hand, becomes impractically long and uncomfortably "back-heavy" when posted (see kencrooker's review of the 580 AL, wherein he had made the same observation). Further dissuading writers from posting the 580; the cap doesn't sit flush when posted, and gets "stuck" mid-way down the piston-filler-knob at the end of the barrel. There are also anecdotal recounts of how posting the 580 can therefore actually cause the piston-filler-knob to be inadvertently twisted while writing, and thus allowing for messy accidents. That being said, the 580 is perfectly weighted and balanced when "un-posted", and 580 users can go for long periods of time without experiencing fatigue and/or discomfort while writing (I once scrawled about 15 - 20 pages worth of text, while taking minutes during a meeting, and not once did my hand come close to cramping). As I had mentioned earlier, at section (B) above, after disassembly these pens can be extremely difficult to put back together again. I attribute this to the sheer number of tiny and intricate ("moving") parts that need to be fitted together perfectly during the reassembly process. However, I would also disclaim that my negative experiences with reassembling my 580 could, in a large part, be due to my own lack of finesse and experience (some 580 users even avoid this hassle entirely by almost never disassembling their 580). TWSBI pens are also notorious for having extremely fragile plastic parts which crack and snap easily. This can happen if the pen is dropped, or if one were to apply too much force when writing and/or reassembling the pens (I found the black-inner-plastic components to be extremely thin and at times brittle during disassembly and reassembly). For brutes like myself, it would not therefore be a stretch of the imagination should these parts end up BREAKING. (In fact, this has been such a prevalent problem for so many people that there is even a fountainpennetwork thread sarcastically entitled "So, Has Anyone's TWSBI Not Broken?" - though the contents of which, from a cursory reading, have been generally positive and in support of TWSBI's products). Further, it is also quite telling when TWSBI's own youtube channel contains a tutorial for removing damaged and/or broken parts from its products (see link here). I confess that in the process of cleaning my 580 recently - I broke the feed section (picture below), and which would therefore explain why I did not include any writing samples with this post. That being said, TWSBI has also garnered a reputation for having excellent customer service (which is honestly not uncommon for a Taiwanese company) and generous warranties on their products. Further, TWSBI is also known for being extremely prompt in replying customers with any such complaints, and thereafter making haste in sending replacement parts out to such customers in a matter of days (via post), after having received such feedback. In relation to my own damaged 580, I have written to TWSBI and (if what I've read online turns out to be true and accurate) I should be expecting to hear back from them soon. Besides breaking easily, TWSBI pens can also be laden with nib and feed problems out-of-the-box. See this other fountainpennetwork thread, with the comments therein suggesting TWSBI pens to be more of a "hit-or-miss" type of product. I, in my humble opinion, would agree, since my own experiences with TWSBI pens have been 50-50 in this regard. In reality, my 580 has been simply fantastic (albeit now broken), while the Mini turned out to be a disappointing purchase. All things considered, I would still highly recommend getting a TWSBI pen. For its reasonable price, superb writing experience, detailed craftsmanship and beautiful aesthetics (check out the entire range of colours available). TWSBI pens are definitely a great investment. 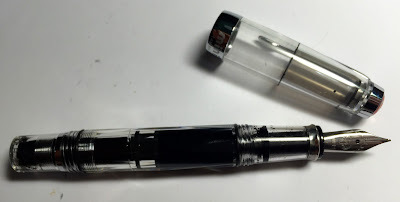 Plus, the risk of getting a dud would undoubtedly be offset by TWSBI's willingness to rectify and/or replace their products when it fails to hit the mark (although you would have to sacrifice some time, effort and monies to get any such replacements). As an aside, TWSBI has also recently introduced its cheaper range of ECO fountain pens (S$38.00 from straitspen.com / US$28.99 from Goulet Pens), which would again be a strong incentive to give this Taiwanese company a chance to impress you! I am so impressed with the original writer of this post. I think this article easy to understand that reader could get useful information and learn lots of things. Stay away from Adware by using Best Anti Adware. Also read about packers and movers in Salt Lake.